Author signings at Book Expo America almost always have really huge lines, and in some cases, attendees have to get up early to get free tickets to get books signed by certain, popular authors. Tickets are given out each morning at 6:45 AM and many of them go quickly, especially for high profile and prolific authors like Joyce Carol Oates. The only author at the Expo that I wanted a ticket for was Oates because I’ve loved her writing ever since I was younger, and I grew to appreciate it even more in college. 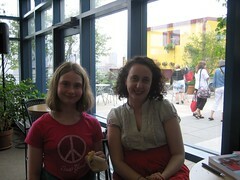 I’d like to say I’m her biggest fan, and I do love hearing stories about her need to write and her eccentricities. However, after getting up at 5 AM to get my ticket when I was on vacation and didn’t have to get up early for work, I was sorely disappointed after waiting in line for nearly 40 minutes to get Oates’ new book, Sourland, signed and to meet one of my all-time favorite authors. We were told she was stuck in traffic and would be at Javits soon, but after 20 minutes more of waiting, they told us that they would hand out the books so we didn’t have to wait in line. 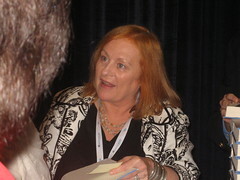 Authors are only given between 30 minutes and an hour to sign books, and ticketed authors don’t even guarantee that everyone with a ticket will get to meet the author or receive a signed book. For me, waiting for my writing inspiration in line for more than 40 minutes only to find out that she couldn’t be bothered to show up at the appointed time was more than disappointing to me. I had heard that she doesn’t like public functions and that she doesn’t like when fans talk to her in autographing lines, but I still wanted to meet her and have my book signed, but to me, her absence was a slap in the face. I have vowed to meet her someday regardless of this incident. 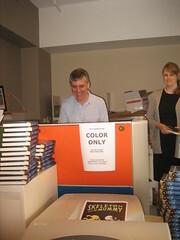 I do want to share with you some photos of author signings for non-ticketed authors. The Girl from Diary of an Eccentric got to meet R.L. Stine and I got to meet the poetic YA author, Beth Kephart, and The Lace Reader author Brunonia Barry. What authors were you anxious to see? 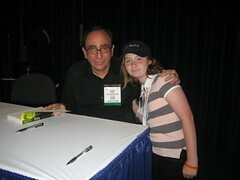 Tell me about your author signing experiences. 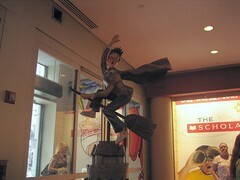 Entering into the Scholastic building, the lobby has a number of classic icons from literature, including Harry Potter. 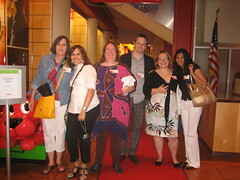 It was great to see some bloggers I’ve met before, but also to meet some new-to-me bloggers. I’ve got a couple of group blogger shots. One group shot was taken by The Girl, includes Kathy of Bermudaonion, Julie of Booking Mama, Laura of I’m Booking It, Pam of Bookalicious, and Swapna of S. Krishna’s Books. 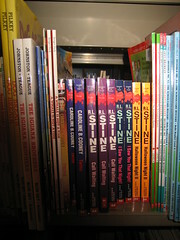 The second shot was taken by the Scholastic staff. Thanks to all of you. Everyone will be talking about Book Expo America and Book Blogger Convention, but I wanted to start off my discussion with food. I love food! I love eating in new places, and I am growing to like trying new things. Hot & Crusty is a great place for breakfast with yummy pastry and so-so coffee, though the hot chocolate rocked! One of my goals last week was to eat from a street vendor’s truck, and I accomplished it by eating a hot dog, though I think that I was less thrilled with the actual hot dog than I thought I would be. 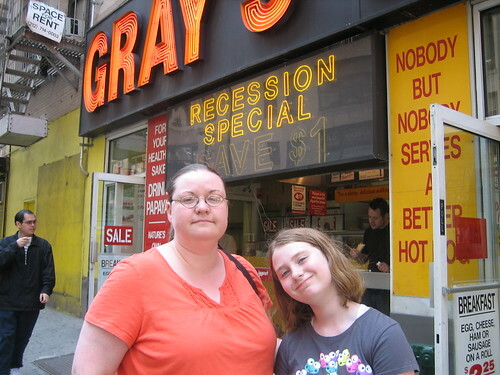 Rather, I would recommend eating at Gray’s Papaya in NYC, in which patrons can get 2 hot dogs and a smoothie for a mere $5. I really loved the hot dog and the pina colada. 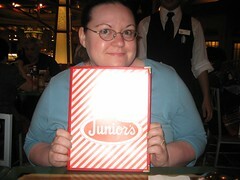 Junior’s was another great restaurant we tried, though I didn’t get to have any of their highly recommended cheesecake. We couldn’t find the location in Times Square, but we did find a little version in Grand Central Station. 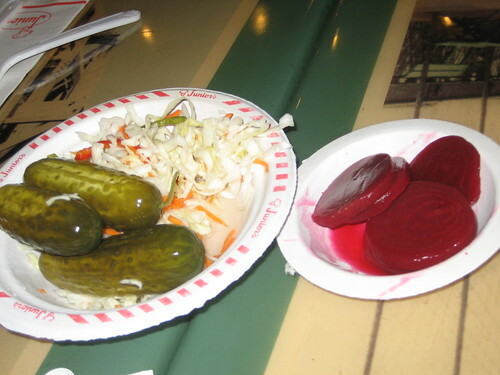 I had a great chicken Caesar salad, but the appetizers of pickled beets and pickles made my day! They were delicious. I’ve always loved beets for some reason, probably brings me back to my nana’s garden when I was younger. 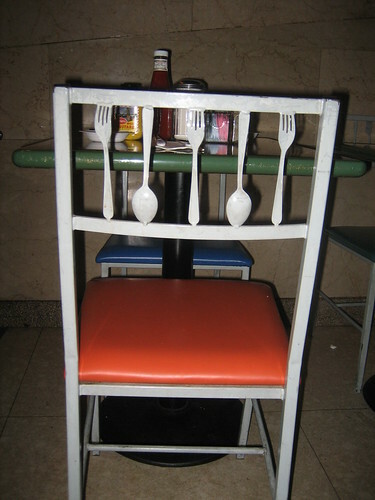 Check out the beets and the cool chair with the silverware . . . There are only two other meals I want to talk about and show you, bear with me. 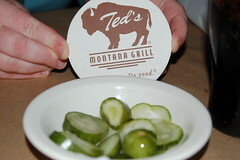 Ted’s Montana Grill was one of the best places we ate in NYC, and it is the place I ventured farther from my norm — I had a bison burger. I was so hungry that I forgot to take a photo of my burger and any of the other meals, but I did take a photo of the yummy homemade pickles and the dessert. Another great thing about this restaurant is the care taken to remain earth-friendly from the recycled paper products to the differing flush control for liquid versus solid wastes. 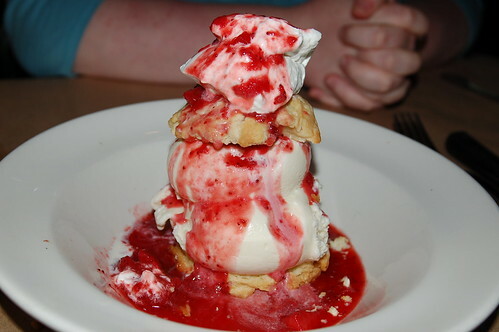 We only got one dessert, a strawberry shortcake with homemade biscuits and freshly made vanilla ice cream that was smooth and very cold. Can I just tell you that it was to die for. Yes, we finished off the entire thing. Finally, we had a great family-style dinner at Tony’s DiNapoli with a bunch of bloggers, including our table with Amanda from The Zen Leaf, Amy of Amy Reads, Natalie from In Spring it is the Dawn. Talk about getting to know one another over dinner — what foods do you like to eat and more importantly what foods are you willing to share?! 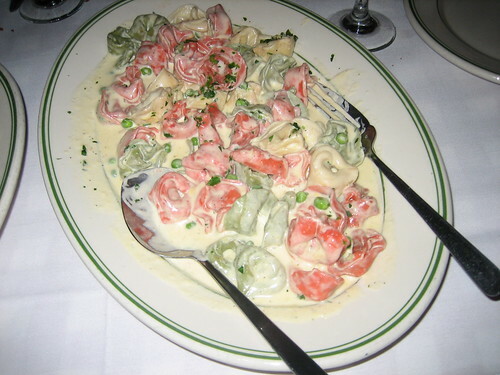 LOL We opted for an appetizer of fried zucchini and two pasta dishes — Alfredo Tortellini and Ravioli Bolognese. All were delicious, and I really loved the white wine sangria. 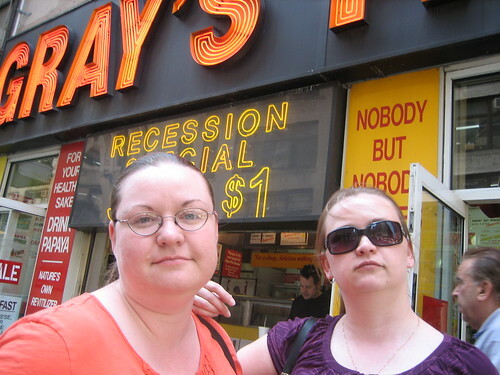 What kind of food did you eat in NYC? Or what kind of food is outside of your normal comfort zone? Book Expo America and the Book Blogger Convention are around the corner, and I’ll more than likely be incommunicado for the next week as I have some fun in the city and at the conventions. If you’ve missed my advice for your trek into the city, please check it out. I hope you’ve all got your travel plans made and your comfortable shoes on your feet. This week is going to be busy and fun, but tiring. Don’t worry, you’ll be hearing all about it when I get back. While I’m away, my mom, Pat, will have taken over the blog for the week beginning on Monday, May 24, to regale you with her reviews. Please stop by and check them out, especially if you are looking for a new suspense or crime thriller. Madam Tussauds Wax Museum, with Edward! There are many other items on my list, but I didn’t want to bore you with all those crazy details. What are your plans for NYC? If you’re interested in meeting up, contact me via email. Have a great week everyone. Stay tuned for my review of Saving CeeCee Honeycutt by Beth Hoffman tomorrow. The Writer’s Center hosted the Writing the Future conference on March 20, which I attended after a kind invitation from the center. Sorry for the poor quality of my photos; I had no idea the lighting would be so somber — I would have brought my SLR otherwise. Unfortunately, I missed most of the first panel thanks to the Metro system and its track delays all morning, which was not fun — sitting in dark tunnels for 20-30 minutes on end without any updates. But, I digress. The second discussion, which started at about 10:45AM, touched upon how technology is changing and how writers can take advantage of those changes and latest tools. 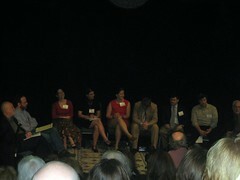 The panelists included Jay Ogilvy, Lee Gutkind, Richard Nash, Sandra Beasley, Lauren Cerand, Sarah Courteau, Jack Sallay, Dan Sarewitz, and Jeff Kleinman, with jobs as literary agents, writers, poets, publishers, and academics. These panelists talked about how to improve match-making between writers and readers by creating communities in which they find one another, which would cut out legacy publishing — a term used to describe traditional publishers like the Random Houses and Simon and Schusters. The traditional thought about holding a mass market inventory of books to supply to readers is fading into the distance, which is why writers need to find new ways of reaching their audiences, either through social media or their own Websites. Social media is making it easier to highlight small presses and lesser-known authors in a sea of millions of writers. One mistake many writers and publishers make is that they view paper as something more than a vehicle through which to express their writing, ideas, and tell stories. One of the major highlights of the panel was the information provided by Jack Sallay about his small start-up business, Vook that combines multimedia with the written word. 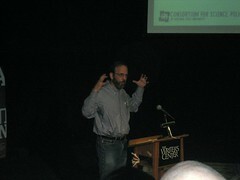 He discussed a wide range of multimedia combinations from music to video embedded with the written word. Some of the videos are done with the help of filmmakers and authors, while others are cute videos of bunnies or other items and tied to books, like The Velveteen Rabbit. Sallay noted that the project has been more successful than expected. One surprise at the conference was the presence of the New York Times’ Nick Bilton, who writes for the Bits Blog and has written a new book, I Live in the Future & Here’s How it Works . He discussed the wave of the future in technology and the creation of flexible screens that will eventually replace paper books and maybe even Kindles and other devices. I think the main takeaway from the conference is that the publishing industry continues to be in transition, especially in terms of how readers are matched to writers and how those relationships are sustained. Writers will need to understand their writing, what audience it is best suited for, and create a platform through which they can reach out to audiences and readers alike. Writers will have to become business people and look out for the best ways to market themselves and their work by using the latest technology. I’m going to leave you with a bit of video from the final panel on ethics in nonfiction and memoir, which got pretty active between audience questions and discussion among the panelists. Also if you want to see the rest of the shoddy photos I took, go here. 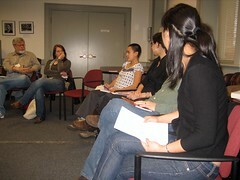 The 2010 Split This Rock Poetry Festival in Washington, D.C., is a biennial event and is in its second year. I was able to attend this year, and travel to a part of D.C. that is in transition and that I haven’t been to in a long while — the home of Ben’s Chili Bowl on U St.
March 10 was mainly an exercise in registration for me, but March 11 — the second day of the festival — was a whirlwind. If you want to check out the crazy schedule, it is here. This year, I didn’t make it to any of the evening readings, but I think at the next one, I will make a concerted effort to do so. The second panel I attended, The War is Not Over: Writing About Iraq and the Case of the Mutanabbi Street Coalition talked about a bombing event in Iraq that has blurred with many others for me and ended with a surprise for everyone — a survivor of the Mutanabbi Street bombing was in the audience and came forward during the discussion period to talk about the time before, the time during, and the time following the bombing. Despite his rough English, the significance of Mutanabbi Street for the Iraqi people as a place of commerce and intellectual discourse shined through. It is mostly known for its book stalls and its booksellers. He talked about how even though street names were changed in many areas under Saddam Hussein’s reign, the streets named for poets and other writers remained the same. 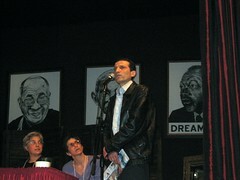 The bombing created a “crisis of culture” according to the panelists. The audience member — forgive me, I didn’t get his name down — said that the process of rebuilding Mutanabbi St. continues and is amazing to witness. While eating lunch at Busboys & Poets with Fred and a few of his colleagues, Karen of WordWorks and Marty — who volunteered to shuttle participants of the festival from various events — a film festival began, combining poetry and video. Some of the videos were abstract, while others were vivid in their use of images, music, and words. The second panel I caught was Documentary Poetics with Martha Collins (another colleague of Fred’s), Mark Nowak, and Philip Metres. From using newspapers and other documentary evidence to provide substance and anchors to a poem to using photographs and video, each poet discussed why they choose to use their source material and how it creates an alternative history for readers. Nowak, unfortunately, had a technical malfunction with his presentation and we were unable to see the images he planned to present. The four days of the festival were full of energy and enthusiasm, but as one who has been outside the poetry circle for some time, I felt on the fringe of the discussions during downtime. I’m not a very social person in many instances, especially in crowds of strangers. I liked the energy these poets have when it comes to their convictions and opinions, but I often find that many of these events are for people who already know one another to reconnect and chat within their own groups. 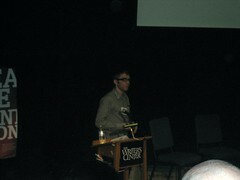 I did step out of my box a bit and chat with a few other poets that seemed on the fringe like I was. One attendee traveled all the way from Tennessee for the event! 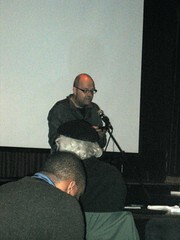 The power of poetry continues to reach out into the community, which is a positive sign that poetry is reviving. 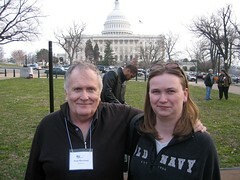 Finally, here’s a photo of me with Fred Marchant. 2010 Split This Rock Poetry Festival in D.C.
MARCH 10-13, Washington, D.C. will host the Split This Rock Poetry Festival, which brings together poets and activists to speak out on the latest issues facing our nation. This year, there’s a lot to discuss with two wars, an economic crisis, and more. The festival features readings, workshops, panel discussions, and other activities and it is a mix of performance, poetry, and film. I’ve never been to this event, but this year I received a scholarship to cover the registration cost of $75, which is the early bird price through Feb. 20, 2010. So if you’d like to go, register TODAY! For information about the scholarships, go here. Check out the schedule, which is being updated regularly. I probably won’t get to all of these panels since some of the times overlap, but you can bet I’ll be blogging about the festival and showing you some great photos. Did I forget to mention that Bruce Weigel will be reading. There are individual reading tickets available for $8 as well, so even if you want to just attend a reading, you can! This also marks the first time I will be visiting the U Street Neighborhood and its cool venues. One of those venues is Busboys and Poets, which I’ve been dying to get to! Thankfully, there is a great list of venues and directions on the festival Website. OK, I’ve left out the best part of the festival — besides the panels and the readings — THE BOOK FAIR! Not that I need more books, but it will be good to check out new-to-me poets and their books, and maybe break that book-buying ban! Now, I don’t consider myself an activist poet, but I’ve always admired their work and would love to take this opportunity to learn more about them. I hope some of you in the D.C. area will join me. It’s bound to be a lot of fun, and there is an end-of-festival party! What panels would you like from the list? Which ones do you think I should attend? 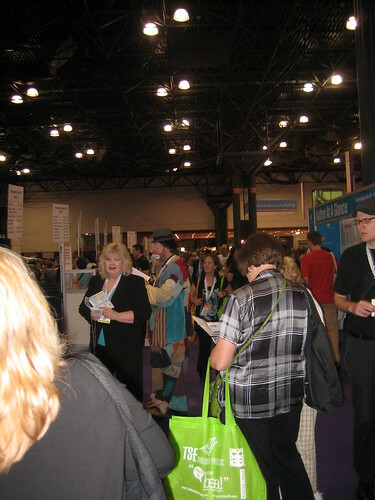 By now, I’m sure you’ve seen the Book Expo America and Book Blogger Convention 2010 tour posts to drum up excitement and provide practical advice to attendees. Today, I’m going on the assumption that you ARE going to BEA and BBC because it is the biggest BOOK PARTY in NYC (May 25-28). 1. First order of business is RESERVE your hotel room NOW through BEA’s discount program. These rooms will go fast. Once you reserve your room, you can look for roommates to share the cost with. If you haven’t met any other bloggers, don’t worry, we don’t bite (much) and would love to share a room with you. If you prefer, there is a hostel in New York City, check out The Zen Leaf’s pros and cons post. 2. Second, pick a mode of transportation to NYC. Depending on how close you are and how much you dislike airport security, you may want to consider Amtrak because the costs are lower, the security is smoother, and the trip allows you to read a book. If you have AAA, you can get a discount on travel and BEA indicates Amtrak will give you as a BEA participant a 10 percent discount on the lowest fares. Traveling from D.C. to NYC last year by train was smooth, and the train drops you in Penn Station, which is right near the NYC subway, making it convenient for getting to your hotel destination. 3. Third, if you plan to arrive earlier than the beginning of the conference, plan out what sights you want to see. Whether it is the Statue of Liberty or Strawberry Fields, having a plan makes it easier. But in addition to sights, make sure you check out the areas where you plan to visit to see what restaurants are available. I always make a plan of places I want to eat, especially near famous landmarks and museums. 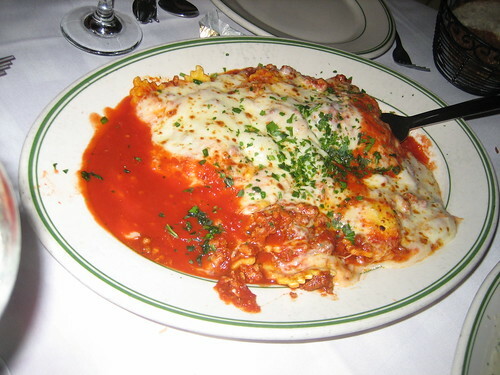 Makes it easier to grab some good grub, in budget, when you find that you are ravenous! BEA does offer discounts on event tickets and monuments, and according to the Web site, there will be additional incentives for food places as well. 4. Fourth, pack your bags! Imagine a book connoisseur who also loves photography. You can imagine what this individual (ahem, me!) would take with her on vacation. I have a digital SLR Nikon, which I failed to take last year, but you can bet that won’t be happening again this year. This will require not only charged batteries and a charger, but also an additional long-range lens and cleaning paraphernalia. Good thing I have a backpack case for all this stuff. Will I bring it all? Not sure, but I know I need a plan. Traveling by train or plane will give you time to read, which means you will want to bring books. BUT remember why you are going to BEA — networking and BOOKS! I suggest you pick 2 likely candidates or 1 chunkster, but not more than that. YOU won’t have time! From the moment your feet hit the ground, you will be running and excited and overwhelmed. I also tend to pack clothes that are versatile. Clothes that present well, but are casual and comfortable. Docker slacks, nice t-shirts, and a few blouses . . . and of course, as you’ve heard COMFORTABLE FOOTWEAR! I have a foot problem, which means I only wear sneakers because dress shoes aggravate me. 5. Fifth, While in the city, you want to make sure you have a transportation plan. Do you want to pay hefty cab fares over the course of a week? I know I don’t, and I didn’t. 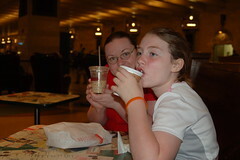 Anna and I took the subway and the bus last year, which was made simple with the NYC MetroCard. We bought day passes, since we only attended about 1.5 days of BEA last year, but this year, I’ll be picking up the $27 7-day Unlimited Ride MetroCard (click to see where you can buy these cards), which means all trips are covered for seven days and bus ride transfers are covered as well! Great deal for sight seeing and for getting to and from the Javits. There are shuttle bus routes at a variety of hotel spots throughout the area that take you to Javits as well. I tend to prefer the freedom of the subway because I don’t have to worry to much about timetables. 1. Book(s) to occupy travel time. 2. Rolling suitcase with minimal clothes and enough room for books on the way back. 3. Comfortable shoes and clothes. 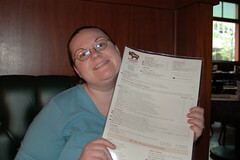 4. Business cards; I got mine from MOO, and I LOVE them. 5. Plan for tackling the autographing lines and BEA/BBC events. 6. Camera for those photo ops with other bloggers, authors, and more. 7. Water/Snacks/Gum or Mints to keep you refreshed. 8. Spending money for food, sight seeing, and nights out. 9. Tote bag to carry all those ARCs, Galleys, and books. 10. Notebook and pen/recorder to make sure you remember everything you want to blog about. I hope this advice helps and that I will see all or most of you there! If anyone wants to meet up while in NYC, I’m all for it. FTC Disclosure: I am not affiliated with MOO, but really recommend their business card services because my business cards came out AWESOME.